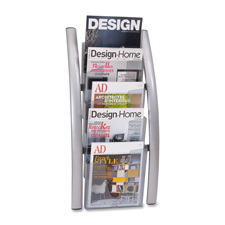 Literature display stand features a unique vertical design with a mix of metal and plastic as well as clean updated lines. Design makes it easy to identify documents. 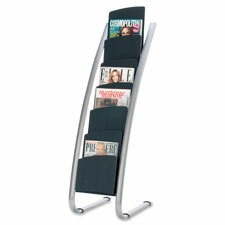 Easy-to-assemble stand offers a large capacity with six compartments. 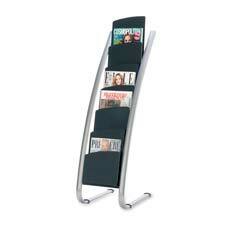 Metal features a powder-coat finish for durability. 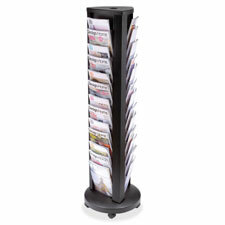 This stylish carousel floor literature display tower offers 39 translucent compartments (13 on each of three sides) that each hold up to 230 legal format sheets. 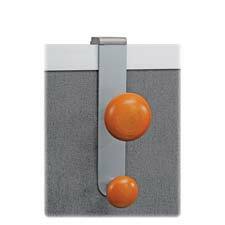 Translucent compartments provide immediate identification of contents while rotating design on four rolling casters (two locking) provides easy access to displayed documents and effortless mobility. 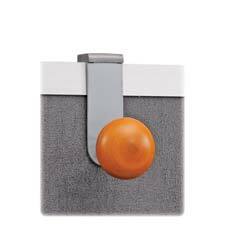 Garment peg slides easily over cubicle walls to hang clothing. Design includes a single peg.